With the world watching US President Donald Trump and North Korean leader Kim Jong-un hold a historic summit in Singapore on Tuesday, the eyes and ears of South Koreans were fixed to the live TV footage. Watching a summit thought unimaginable just months ago, South Koreans raised both hope and concerns for future relations with the “brethren” North, which has been separated from the South since the 1950-53 Korean War. 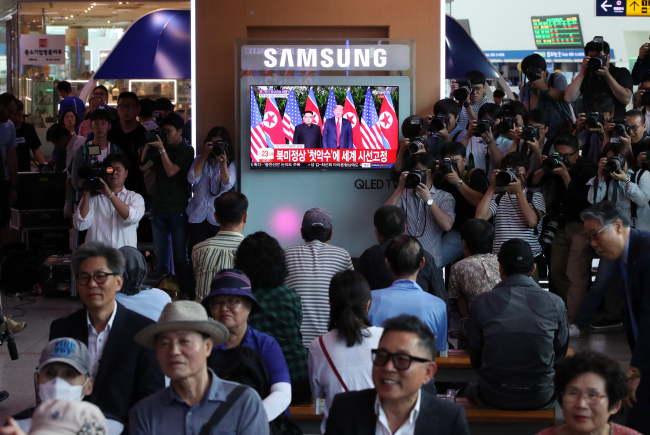 At Seoul Station in the morning, busy passers-by stopped to watch the two leaders exchange the historic first handshake and opening remarks on television screens. Reporters of Korean and foreign media outlets also crowded the station to capture the reactions of awed South Koreans at the center of the capital. “I am both excited and worried about today’s summit,” Kim Jeong-hee, 50, told The Korea Herald in Seoul Station. Kim, who lives in China and came to Seoul for a visit, also called on South Korean President Moon Jae-in to make greater efforts as a negotiator to forge better relationships with the United States, China and the North, and once and for all reduce tensions in the region. “I saw hope in the inter-Korean summit, and President Moon has played the biggest role as a negotiator,” said Kim Yong-il, 82. Kim said he held some hostility against the young communist leader before, but it dissipated when he saw Kim open to negotiations. Others also appeared to have changed their views of the North Korean leader, who had been hidden behind a veil prior to the inter-Korean summit with President Moon Jae-in on April 27. Lee Cheol-young from Daejeon said Kim and Trump both are “deceptive” characters. Lee added that President Trump likes to display “showmanship” and that would be one of the factors that could bring about good results from the summit. When Kim and Trump stood side by side to shake hands at the start of the historic summit, viewers at the station applauded. Some foreign travelers appeared bemused at the reaction, though they also wished for the best outcome. “I am actually baffled to see them clapping here. 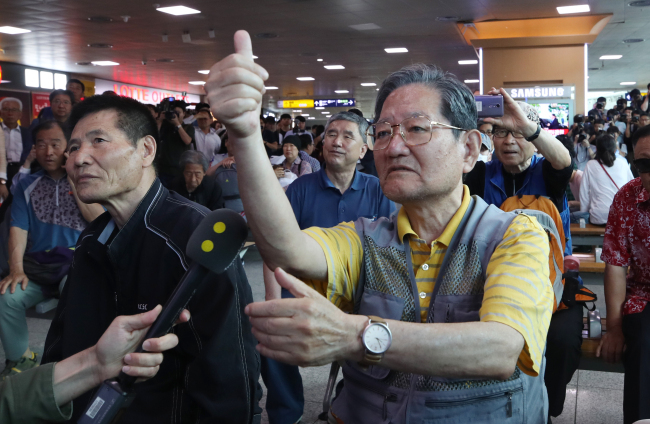 I believe it is the reactions of hope,” said Paresh Mody, a traveler from England, as he stood and watched the crowd and media gathered inside Seoul Station. 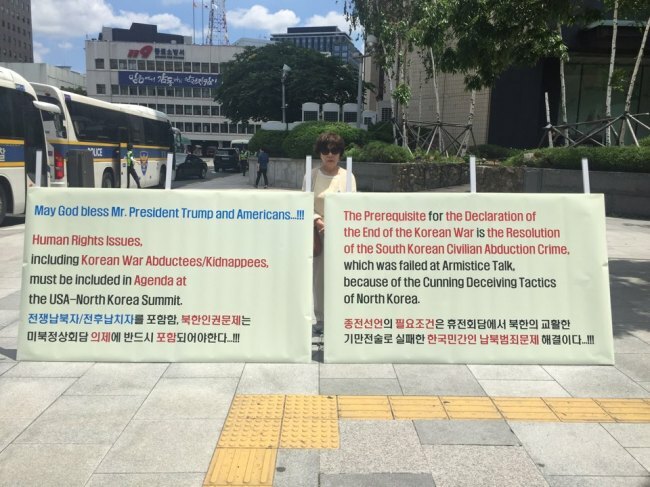 In front of the US Embassy in Gwanghwamun, central Seoul, the Korean War Abductees Family Union hosted a rotating one-man rally while the summit was taking place, to express support for President Trump and in hopes for Trump to raise humanitarian issues during the dialogue. Members of the minor People’s Democracy Party also marched in front of the US Embassy, demanding the US president and North Korean leader immediately sign a peace treaty and for the US to withdraw its troops stationed in South Korea. When the two leaders signed a bilateral agreement in the afternoon, many South Koreans praised the result, while some also expressed skepticism. A startup business owner, who refused to give his name, said it is too soon to make a judgment on Tuesday’s agreement, as Kim and Trump have often changed their positions in the past. “The two leaders mentioned denuclearization (on the Korean Peninsula) today. While it could be pushed in a gradual manner, I think the ‘complete’ denuclearization will not happen in the near future,” he said. “The (US-North Korea) declaration is not fully satisfying, it could have carried a more solid result. But at least the atmosphere appears to have reduced the existing tensions between the two,” Lee Hyun, an office worker said. University student Choi Soo-won, 23, said he has his hopes up as President Trump is an “unpredictable” figure, as is Kim.